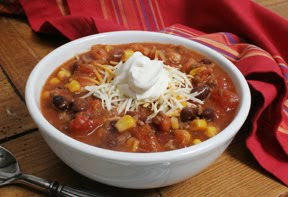 I am sharing one of our favorite soups. We like it even better than chilli ! Place all ingredients in a soup pot or large kettle, bring to boil, then simmer on low about 15-20 minutes. Serve with crushed taco chips and shredded cheddar cheese and a dollop of sour cream if desired. Also works great in a crock pot. It is a beautiful day in Indiana. I think we are having our October weather in November. What a blessing it is, because the farmers can now harvest their crops. Sounds yummy, Joan! I will have to try this sometime! Hi Joan, for us non-canners out here, about what size would you say on the canned tomatos. I was thinking two 28 oz. cans in their juice. But it's maybe the 14 oz. size. I want to make this for a care ministry meal along with some cornbread. Lookin' forward to your reply. Sounds yummy -- printed the recipe -- thanks! Your soup looks and sounds delicious. Thank you for sharing the recipe with us.